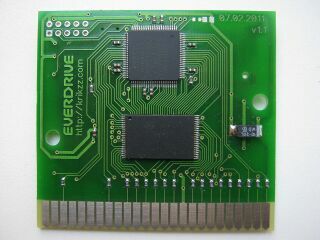 The Master Everdrive, is a flash cartridge for the Sega Master System. Like other releases in the Everdrive family, it allows Master System ROMs, loaded onto an SD card (with a capacity up to 2GB), to be to be played on real hardware. It also has an optional mini USB port for transferring ROMs via USB cable (though only while the cartridge is plugged into the console). The Master Everdrive can run all Master System games, but also all SG-1000 games, provided the game is less than 1MB in size. Similar to other forms of backwards compatibility, SG-1000 games will not boot if the Master Everdrive is used in conjunction with a Power Base Converter in a Sega Mega Drive.